In order to have the best dog possible, you need to begin training her right away! This is often easier to do with a puppy than with an older dog, (the “golden period” for learning in puppies is from 3 weeks to 14 weeks of age) but older dogs can definitely be trained too! One of the best ways to begin training your puppy is with a training class. These classes are based on positive reinforcement (praise and food rewards) and are essential for every dog. Dog trainers help you to understand how your dog thinks, and how to communicate with him. Classes also give puppies a chance to play with other dogs, and are great fun. In typical training classes, your dog will begin learning to come, sit, lie down, stay, and take treats gently. You will begin teaching him not to pull on the leash. Training is something that never stops, no matter how old your dog is. The most important part of a class is in teaching you how to work with your dog, since you will have to continue to encourage and reward good behavior for the rest of his life. Training continues at home, of course, and while training is for your dog’s safety as well as for the safety of her family, it’s also a wonderful way to interact with your dog. Well-trained dogs come when called, and respect their guardians. Training and positive reinforcement keep dogs from being bored and make them feel happy and stimulated. Teaching your dog to do “tricks” helps bond to you to each other as a team. It also gives you valuable opportunities to praise and reward her. Dogs thrive on these positive interactions; in fact, for every time you have to tell your dog “No”, you should find 3 reasons to praise her for something she did right. “Tricks” give you these opportunities to praise and reward her. COME: Begin calling your dog to you in a lively and happy voice, and rewarding her with praise and a treat. Some dogs are naturally very good at this. Other dogs are more tempted to stray and should frequently be rewarded with treats for coming, even long after they have learned the command. This command is vitally important for your dog’s safety. 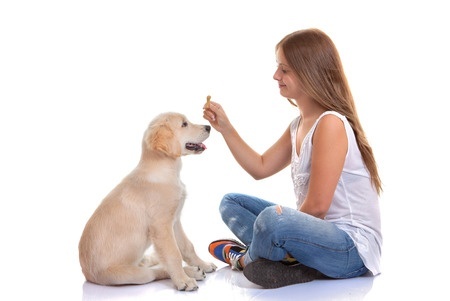 SIT: Hold a treat in front of your dog’s nose and then guide her nose up and back until her rump comes down. Praise her, give her the treat, and repeat this exercise several times every day. Eventually she should learn “down”, “stay”, and “drop it”. Training dogs is NOT always easy, so ask for help from us or from a trainer if you need it! NO BITE: Some puppies bite at people when they are playing. This is a natural behavior, but they need to learn never to bite people, so if your dog bites playfully at hands or clothing, say “off” or “no bite” with a sharp voice, and immediately try to provide a chew toy (try to have them handy). Praise her as soon as she stops. If you can’t get her to stop biting, you can give her a little “time out”. This is not a punishment! It’s just a little time (5 minutes) by herself with some toys, to allow her to calm down. HANDLING: Handle and massage your dog all over, especially her ears, her feet, and under her belly. Open her mouth wide once a day and reward her with praise and a treat. Look in her ears, her eyes, and under her tail. Hold her in your lap if you can, or try to roll her on her back. Let her up if this is upsetting to her. Do all these things at least once a day. Reward her with treats and praise. FEEDING: These particular exercises are to be done by adults, not children! Do NOT try them with dogs that have shown any food-related aggression in the past! (For those dogs, consult with a trainer or veterinarian.) Hand feed your dog several pieces of food, praising her for taking them. Then put the food bowl in your lap and allow her to eat out of it. Put the bowl on the floor and put your hand in her food bowl while she is eating, to put food in first, and then to take food out. Touch and handle her body while she is eating. EXERCISE: Make sure your dog gets plenty of exercise! This will prevent many behavior problems. Walk her at least twice a day, teach her to fetch balls, and take her to dog parks or other places where she can run off-leash safely. Putting your dog out in the yard is not the same as exercising her! CHILDREN: Make sure children (especially younger ones) are gentle and careful with your dog. Dogs can be fragile and breakable! They can become fearful and aggressive toward children if dropped, hurt or teased. If dogs are fearful or aggressive, they should never around children unsupervised, and in some cases they should not be in contact with children at all. Children are impulsive, unpredictable and small, and are far more likely to get bitten by dogs than adults are. OTHER DOGS: Let your puppy play with other puppies and with gentle dogs so she learns to get along with other dogs. THE WORLD OUTSIDE: While they are young, puppies should be exposed to a variety of situations and to people who look, dress and act differently from your family. Have these people give your dog treats. Without this socialization, dogs can become aggressive towards unfamiliar people. These dogs can be a threat to society and are often euthanized for aggression. They are also very difficult to treat when they get sick. Make sure you get your dog used to as many different people as possible. Also, bring her out of your yard on a leash and let her see other places. TIME ALONE: Dogs should learn to spend some time alone early on, preferably for short periods at first, with lots of chew-toys and treats. Try to work up to longer periods gradually. It’s an excellent idea to set up a camera for a day to see what your dog does when you leave her alone. She may be more anxious than you realize, and separation anxiety can and should be treated. SAFETY: Try to make your dog’s environment as “puppy-proof” as possible, and provide lots of chew-toys. Spraying forbidden objects that you can’t remove, such as furniture or electric cords, with a spray called “Bitter Apple” (available in pet stores) may help, but is not completely reliable. You may need to use baby gates to confine your puppy to a safe area when you can’t watch her. Please feel free to call us and ask questions about your dog’s behavior! 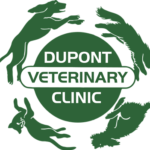 We consider it to be of the utmost importance and can also refer you to a professional trainer or a veterinary behaviorist for even more specialized advice.